Some of the highest summertime temperatures in Spain are recorded at Sevilla, in the Guadalquivir valley. The highest maximimum temperature is quoted by some as 51 degrees in 1876 although the accuracy of this figure is in doubt. Official records in more recent times have shown temperatures of up to 47 degrees. To the south east of Seville city however, summer temperatures are likely to tempered by breezes from the nearby Atlantic coast. 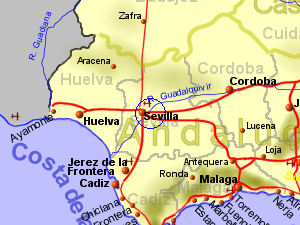 Apart from this, the climate and weather conditions around Sevilla should not vary much except to the north where there is some higher ground (the Sevilla weather station is only 8m above sea level inspite of being 60Km inland).